In a press release issued earlier today, Atari has revealed the development of a Dragon Ball Z title for the Nintendo Revolution called Dragon Ball Z: Budokai Tenkaichi 2. With the announcement of Red Steel and Sadness for the Nintendo Revolution, this marks a continuing flood of Revolution information. It only serves as a reminder that E3 is quickly approaching, expected to be the first time the Revolution will be shown off to a wide array of press and media for hands-on experience. GamesFirst is still waiting for screenshots from the publisher. We\'ll post them as soon as we have them. Atari announced Dragon Ball Z: Budokai Tenkaichi 2 by saying that, \"The... controller featured with Nintendo Revolution is perfectly suited for Dragon Ball Z... which engages players with fast-paced fighting moves.\" Dragon Ball Z games on the current generation have mixed fighting with RPG elements to varying degrees of success. The antics of Dragon Ball Z seem to make it a perfect fit for the Revolution\'s controller, according to Atari. The game will include characters from the entire span of the Dragon Ball Z sagas, and is scheduled for release near Christmas in 2006. This will not be the first Dragon Ball Z title to utilize your body motion in order to fight; stand-alone TV-plug-and-play Dragon Ball Z games that tracked your hand motions were on display at the Digital Entertainment Expo Hong Kong at the beginning of this year. 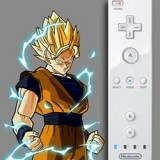 However, it will be the first Dragon Ball Z title to utilize the Nintendo controller.
? Budokai Tenkaichi 2 Game Set for Nintendo Revolution ? NEW YORK, NY, April 24, 2006 ? Atari, Inc. (Nasdaq: ATAR) today announced that Dragon Ball Z? : Budokai Tenkaichi? 2 is in development for Nintendo? Revolution. Combining action, fighting and light role-playing game (RPG) elements, Dragon Ball Z: Budokai Tenkaichi 2 will send players into a rich story mode that spans the entire Dragon Ball?, DBZ, and Dragon Ball GT? series. Developed by NAMCO BANDAI Games Inc. / Spike, Dragon Ball Z: Budokai Tenkaichi 2 is slated to release during the 2006 holiday season. Dragon Ball Z: Budokai Tenkaichi 2 takes the series\' popular acrobatic and intense 3D flying and fighting dynamic and takes it to a whole new level with over 100 playable characters, 15 vast and vibrant 3D destructible environments, and nine different game modes, including single and multiplayer battles. Matt Collins, Director of Marketing, Atari, Inc., said \"The innovative controller featured with Nintendo Revolution is perfectly suited for Dragon Ball Z: Budokai Tenkaichi 2, which engages players with fast-paced fighting moves. Gamers will be able to play in a very physical way, mimicking several of the show\'s most popular character moves and pull off awesome combos and attacks.\"
In addition to the unprecedented number of characters, wide selection of massive 3D destructible environments and abundance of game modes, Dragon Ball Z: Budokai Tenkaichi 2 will feature in-game transformations, which players will be able to trigger in real-time, making battles even more dramatic and exciting than ever before. Using the Nintendo Revolution controller, players will be able to mimic signature moves as they are performed in the Dragon Ball Z animated series, such as Goku?\'s Kamehameha, moving both hands to execute this devastating energy attack. Dragon Ball Z: Budokai Tenkaichi 2 is set for release this holiday season. For more information on Dragon Ball Z video games, please visit http://www.atari.com.